As a physician in primary practice, I care for the skin from the inside out and the outside in. I undertake a thorough evaluation of each client’s health and needs in order to tailor an individual program. This includes a medical and cosmetic history and if required, appropriate lab testing. I offer the latest in non-invasive skin care treatments, recommend products that have active ingredients and provide medical prescriptions when appropriate. My integrative approach to skin care may also include advice related to nutritional, hormonal, life-style issues as all are reflected in the skin. I recommend the simplest, safest, and most cost-effective solutions to produce optimal results. I am passionate about my work, have an artistic eye and take the time to ensure a natural look. DISCOVER YOUR BEST SKIN @ DFRx! 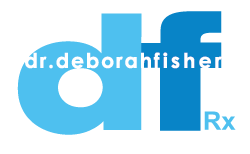 Dr. Deborah Fisher is a licensed medical doctor who has years of advanced training with prominent plastic surgeons and cosmetic dermatologists and has performed thousands of procedures in her practice. Academically, she has acted as a clinical investigator in medical research and clinical drug trials. For many years she was an active member of the Continuing Education Committee at Mount Sinai Hospital. Dr. Fisher has been a sought after lecturer by professional colleagues around the world, and has made numerous media appearances. Dr. Fisher’s dedication to provide complete and uncompromising patient care motivated her to respond to an ever-increasing demand for better skin care from adolescents and menopausal clients for management of related skin problems as well as from survivors of breast cancer. This stimulated her quest for additional education and practical instruction in the areas of skin care treatments and enhancements. Dr. Fisher has trained with, and been certified by leading experts in the fields of Botox injection, dermal fillers, chemical peels, use of laser therapies, and medical skin conditions such as rosacea, eczema etc. In addition to her knowledge, experience and continuing education in general medical concerns, Dr. Fisher’s expertise in nutrition, fitness and management of hormonal imbalance helps her patients achieve optimal health and glowing skin. Her attention to detail, gentle touch, state of the art techniques and equipment in addition to her commitment to natural results have gained her a reputation as one of the top physicians in her field performing non-invasive skin care. Dear Dr. Fisher, I am so happy with work you did on my face yesterday. I look in the mirror and I don’t cringe! I didn’t expect to see much of a difference, in fact I was afraid that I might not like what I look like with filler. I just look fresher, less tired and still like me … just a better version! I need much less makeup! You are a star and I am a total fan. On my first appointment Dr. Fisher suggested a series of peels starting with the lactic acid and moving to stronger peels over time. My skin felt wonderful for the first time in years! I am approaching 50 and my skin is healthier and more beautiful now than 20-30 years ago. Dr. Fisher is very honest in her assessment of what results she can achieve for clients. She stays at the forefront in terms of new products/methods. Her skin care line is excellent and great value for the money. Thorough, honest, respectful and reliable. That’s Dr. Fisher. She was not my first stop for Botox, but she is my last. She takes time in her examination and her attention to detail, facial contour and one’s facial structure is like no other doctor that I have been to. She is a gift to all her patients. Dr. Fisher treated my hyperhydrosis condition in two sessions. My right armpit no longer flows or drips and I have total confidence and peace of mind in stressful situations. My wife gave me a new cashmere sweater to celebrate my sweat-free status and I still have a black, unstained sweater to prove it. I thank Dr. Fisher profusely for turning a bad situation to good with virtually no sweat. Dr Fisher’s conservative and sensible approach to improving skin suited me perfectly. We began with a series of peels gradually increasing in intensity. Cumulative effect on the texture, tone and colour of my face were astonishing. These procedures were coupled with several sessions of Botox injections. These made the most dramatic visible difference. The furrow between my eyebrows, which was deep and multi-lined, faded. The crows’ feet blended and my forehead became smooth. I was the same only better… exactly what I wanted. Many people commented on how well I looked but no one guessed what I had done. Perfect! I’ve been struggling with acne prone skin since the beginning of high school. It was only when I began having regular facial peels with Dr. Fisher in the past year that my skin has improved tenfold. Now as a 23 year old law student, my skin is well on its way back to when I was 15! Not only has my skin cleaned up but I no longer have to spend hours applying makeup and coverup to conceal the imperfections. I highly recommend them to anyone wishing to highly improve their skin and self-esteem. I came to see Dr. Fisher… she is amazing. The Botox treatment lasts 5-6 months. She is thorough and caring. Her primary concern is a medical history. I have also had Restylane in my creases around my mouth. What an amazing result! My creases disappeared! My self esteem has increased dramatically. I feel good about myself. My skin was very tired looking and very wrinkled. My doctor injected Restylane in my upper lip, and in the fine lines above my upper lip. She reconstructed the shape of my lips from looking like I was in a permanent frown to a permanent smile. After the injections, people kept telling me how relaxed I looked, how much younger and youthful I appeared. My face looked very natural. Dr. Fisher prepared me for the fact that I may need more injections three months later, but now it is December (eight months later) and my face still looks as great as when I originally had the procedure. I would highly endorse both this product and my physician to anybody who wants a boost in their self esteem, or just in their well being. I am truly impressed. I have never felt better or felt that I look better. Each treatment has benefited different facts of my aging process. Dr. Fisher’s staff is professional and welcoming and Dr. Fisher herself is not only that, but an artist as well. She never overdoes any procedure so that it is always natural looking. My skin tone is much more even and bright. The sagging and lines are considerably reduced and my face looks naturally tighter and feels smooth and wonderful. I would absolutely recommend Dr. Fisher’s treatment to anyone. It’s a joy to feel this good about how you look. I began seeing Dr. Fisher a few years ago for cosmetic peels that reaped great results, and then had laser treatments for removal of brown spots, skin tags, and spider veins. My skin is getting better and better, thanks to Dr. Fisher’s miracle treatments and her skin care line. I have been coming to Dr. Fisher for Botox and Restylane treatments for two years. I have great confidence in Dr. Fisher’s skills, I have always been very pleased with the natural looking results and the office has a very friendly atmosphere. I feel these treatments have given me a boost in confidence as I now look how I feel, which is happy and relaxed. I would definitely recommend both of these procedures without any hesitation. Years ago my niece recommended coming to see Dr. Fisher for chemical peels.I wanted to look as well as possible without surgical procedures. I like the fact that Dr. Fisher is a G.P and has experience in burn issues. She is a very confident, interested person. I feel she knows exactly what she is doing and is current in this field. I look forward to my monthly treatments and get lots of compliments on my skin. I look forward to applying lipstick now that I have had Botox. I have recommended Dr. Fisher to my daughters-in-law and friends. She is a pro.